As most of you know, PWBTS.com, the flagship site of this column, focuses on coverage and promotion of independent wrestling. As someone who happily shills independent wrestling promotions whenever possible, one of the things that pisses me off is the way independent promotions seems to have no sense about the basic sorts of things that they need to do to promote their product. Instead, some promoters seem to think that the way to draw is to hold grudges against any independent promotion operating in their area. They’ll take shots at these competitors online or in print. They’ll tell their talent: if you work for [insert name of competitor], I won’t book you on my shows. They’ll hold multi-promotion tournaments, and not invite the largest one in their area…who just happens to be said competitor. They’ll deliberately run shows against even charity-themed promotions, try calling local police to disrupt their shows…and all sorts of fun things like that. I have a better idea…how about actually advertising your OWN product? I’d like to offer some observations as to some of those things I think that promotions need to do to publicize their product online. I realize that some people may find some of the suggestions listed below to be painfully obvious, but trust me…they aren’t. All too many independent promoters don’t use some or all of these ideas. I’ve seen all too many cases where promoters don’t…well…promote… and crowds suffer accordingly. But that’s not all. If you want something even more amazing…consider that online reporters who submit a ton of independent wrestling news to PWBTS and many other websites…have actually been told by a handful of independent promoters to remove the items he’s placed online… Why? They’ve been told by the promoter that “they can do it by themselves”. That misguided handful of promoters should consider going to their locker rooms at the end of the night, and ask their workers if they enjoy working in front of 50 people, and not getting paid… all because their promoter decided he could “do it all by himself”. You don’t exactly need to attend the Wharton School of Business to know that the most important thing, no matter whether you promote wrestling shows or selling cars… is to advertise, advertise, advertise. If marks like me who run wrestling websites, or social media blogs are ready to help you do so…you’ve lost nothing, spent nothing…and quite possibly gained a lot. Better yet, you can promote your own company online as well. Along with the usual (and necessary) grunt work of getting up posters, handing out flyers, as well as getting sponsors to defer the cost of your show, and help sell tickets for you… all of which are necessary no matter what kind of fan base you have, the most cost-effective way to promote your shows is online. USE SOCIAL MEDIA. C’mon…a Facebook page? Twitter? Anything? Not hard to do these days…just done in a way to get someone’s attention. Even a plain old website (and if you have one, keep it updated. Nothing turns a fan off more than your website showing a three year old show, rather than the one you’re running this weekend). Those work well to promote your product to fans. Even a website doesn’t require technical genius to put up and keep current. Basic ones also aren’t expensive. Hell, just do a Facebook page for each individual event. If you want to spend a bit more money, you can also buy a domain name like mine at PWBTS.com, and pay a basic monthly fee to have it hosted. What should that website/social media notice consist of? If nothing else, it should use intelligible English. Use spell check. PLEASE, PLEASE, PLEASE use spell check, and ask someone to check it for grammar and spelling mistakes before you send it out. While website owners know you want to push your show…lay off releases sent in all caps and with a dozen asterisks and exclamation points. Every match is a great one (or you’d like potential fans to think so…we get the point). Then…UPDATE THE DAMNED THING. Pages with matches from three months ago make you look like amateur hour. Tell fans when your upcoming shows are…far enough in advance to let them make plans, so they don’t go to someone else’s show instead or just stay home. Tell them WHERE your shows are, and how to get to the shows. The locations of your shows should be listed on your website, with directions from nearby areas, using local landmarks and major highways. You can also use Google Maps (my favorite), Expedia, or a dozen other sites to illustrate where you’re running a show. It also would be nice to include mass transit directions if you run in a city where mass transit connections exist to your venue. You can find these directions easily enough on your local transit agency’s website, then post them in your shills. Google Transit is useful in large markets to tell people where transit connections are to specific addresses.. You can also cheat a bit and use nearby landmarks or an existing map, which typically have websites and /or maps that you can use. Other things to do are: Tell fans WHO is on the show and tell fans your current storyline behind key matches, so fans feel there’s a reason to come to see them. The one and only booking related thing I’ll say here: if you list a “major surprise” for your show, to bring in fans… DON’T. “Surprises” as an attraction for the most part have been way overdone. Unless you honestly don’t know if you can get someone, or there is a real storyline reason not to announce…announce it ahead of time. Do it AHEAD OF TIME…not just days before the show. Tell the fans WHAT your tickets cost, and where they can get them. If you have standard ticket costs, list them. If you have remote ticket locations (local merchants that sell tickets for you), list them and where the merchants are located. If you have an e-mail address, hotline, or ticket phone line, list those as well. If possible, have a part of your website devoted to online ticket orders. Some promotions, depending on which venues they run (or for their own ease), may have to utilize Ticketmaster.com, or regional ticket brokers. Others use PayPal or similar sites. If that’s the case, you obviously have no problem. Let them do the work. But be sure to post a direct order link for YOUR show, as opposed to just a generic link to the websites. In addition, don’t simply depend on social media. Yes, that means you have to do posters or flyers. Make sure you flyer wrestling and other entertainment shows in your area in the weeks before your show. If you’re running a show for a charity, make sure they’re publicizing it. yes, that means ASKING THEM if they are publicizing it, and how they are doing so. Ask local stores if you can post a flyer in their store window. See if they can become a sponsor of your show. Let’s face it, if you’re an independent promoter, you need every revenue stream that there is….or in English, you need any way you can to make a dime. Some promotions are small enough that the wrestlers just sell gimmicks at the shows. But others can also do so on their website. Promotions can also use tape dealers like Smart Mark Video (an unpaid ad, as they’re very good, very quick, and all of them love the business) to sell and tape their shows. Now, does your promotion send out press releases before a show, or results afterwards to a website like PWBTS…or the Wrestling Observer…or a hundred others? If not, why not? First, press releases. They don’t have to look like something out of Northwestern University’s School of Journalism. But let me suggest a few dos and don’ts. Again, it’s not necessary to capitalize everything…or use exclamation points and asterisks throughout the release you send to a website. This makes them look like the person writing it is six years old. We know you want people to come to the show, so write an intelligent sounding release that makes both your company and the show you’re promoting look good….in something approaching English, please. You might even learn a bit of basic HTML so people can just cut and paste the items into our posting script and get it up on our websites. It makes things LOTS easier when posting your releases. If you have videos, again…send them to us so we can just embed them. Second, as I’ve said above…PLEASE, PLEASE, PLEASE use spellcheck. Include the things we’ve discussed above… namely to: Tell fans WHEN the show is, WHERE the show is, how to get to the show, WHO is on the show, how much tickets cost, and where they can get them. Again, any basic business course would tell you that a business must make it as easy as possible for a customer to give you their money. But you’d be surprised at the e-mails I receive that don’t provide each of those items. You’d also be surprised at the way some of those e-mails are written. To be blunt, I get some press releases that look like a preschooler wrote them. Again, press releases don’t need to look like something out of Northwestern University’s School of Journalism…but it would be nice if they had correct spelling and at least reasonably good grammar. That’s why Bill Gates created spell check and grammar check. I’ve gotten promotional shills for shows that I had to literally spend 15 minutes re-writing in order to post them at PWBTS. I’ve refused to run shills for certain independents, because I’d asked the promotions time after time to check them before sending them to me, because they were written so poorly that the companies should have been embarrassed to send them out in public. Remember that your press release/shill is how a new fan sees you. If your press release is professionally written (or at least semi-literate), that new fan is more likely to read it, and their money is more likely to come your way. Send it to widely distributed mailing lists of upcoming shows supplied to websites. Post them on any one of the million wrestling related forms of digital communication that are out there, and to regional wrestling websites. Send releases to the mainstream press, such as your local daily or weekly newspaper. See if that newspaper has a weekly wrestling column. A number of newspapers and their online /social media have places to list your event. They’ll often run shills for your show. Mainstream coverage is a Godsend for your promotion. Again, remember the rules I listed above….use spell check and provide basic information. If your local newspaper is a smaller weekly or daily, send it to whoever runs a section for community events, particularly if the event is to benefit a local charity, church, or community group. That’s always a good hook. (and PLEASE be sure it actually benefits that charity, don’t use it as a come-on). Send them to your local TV station or cable system, especially if the event is to benefit a local charity or community group. Put together a e-mailing list of regular contacts and send it out to them to plug each and every show you run. Use the major websites or those that cover either your region in particular or independent wrestling in general to advertise your product. Get your fans to put together an e-Street Team….fans that know how to write fairly well, or provide them with the information to send yourself. Have them talk you up on social media (yes, I mean REALLY versus WWE-style), and anything else out there. Make being a fan of your company not just a fun evening, but a responsibility. ECW was the first known example of a company that understood this, even though they were pre-social media. Fans emailed each other. They posted news on the message boards of the day. They called their friends. Fans all but MADE mainstream wrestling publications pay attention to ECW. Those fans were ECW’s best asset, because they felt obligated to let people know about the product. Let me use an example of a particular promotion I report on frequently. 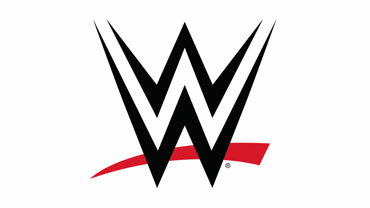 The previous owner and many of their fans believed that they often received what they believe to be unfair treatment and/or lack of coverage by online sources, the Wrestling Observer, and even newsstand publications about their major shows. In one example some years back, the promotion believed that the Observer report low-counted their crowd by a good 25-30% (thus ignoring the fact that they drew their second highest crowd ever). It’s important to realize that most online news sources based crowd counts on what they receive via e-mail. Thus, if someone sends results to a newsletter or website and didn’t like the show, or has a grudge against your promotion, they may low-ball you with a ridiculously low crowd count, and make you look bad. Send out your own information…and, as strange as this may sound for wrestling… tell the truth. Provide websites and newsletters with ridiculously high crowd count, and you’ll be called on it. I know there have been times in the past when the above promotion’s fans and staff were upset at a major website for reviews of shows that were posted. I’ve seen where their fans and staff basically said “screw [insert name of site]“. They said pretty much the same thing in this case regarding what they felt about the Observer report. But the fact of the matter is that major sites like WrestlingObserver.com or PWinsider.com get more hits in ten minutes than PWBTS does in a week or maybe a month. A newsletter like The Wrestling Observer gets at least as many readers in a day versus the page views I get in a month or more. The Observer’s reputation is also far more well-known and respected by wrestling fans than PWBTS or this column will ever be in my wildest dreams or fantasies. Therefore, giving me information to publicize their product is a good thing, but it’d be far better if they also did the same for major wrestling sites. Let me use an example from a different field of entertainment. If you wrote a Broadway play, and had a previous play you’d written panned by the New York Times; does that mean that you’d stay pissed off at them and wouldn’t try to use them to promote your next play, and would just send your releases to the Staten Island Advance? Not if you have any sense, you wouldn’t. Letting your ego get in the way of using an online source or newsletter is idiotic. You’re taking money out of your own pocket and those of your workers…just for spite. Instead, spend some time talking to the reviewer (yes, promoters, that means “kissing up” to those who run or report for websites with such things as press passes, or interviews with your talent) and try to get them on your side. Independent promotions that are able to do so should spend some time with the Dave Meltzers and Wade Kellers of the world, and develop relationships with them so as to get fair reviews for their product and encourage new people to come to shows. Again, send your results….that night or the next morning (not a week, or two or three later) or to wrestling websites. Give a basic outline of who went over, major storylines that were advanced, how well you drew (especially if the crowd was good for your promotion), and a reminder of when your next show is happening. If you had a good show and drew a good crowd, make a point to get the word out…that’s advertising, too. I’m not a graduate of the Wharton School of Business. 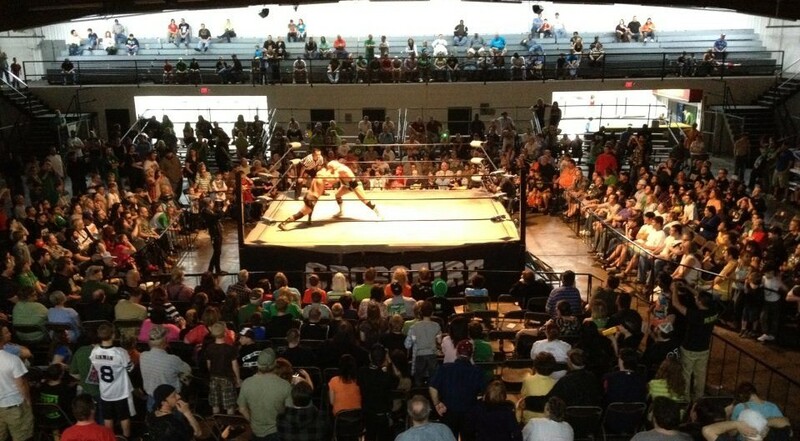 I’m just one more mark sitting in the seats, who just wants to see independent wrestling succeed….at a time when wrestling fans need alternatives…badly. 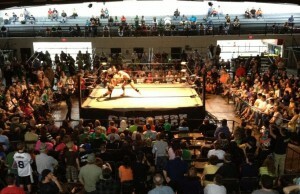 Here are more holiday wrestling shows benefiting Toys for Tots, food pantries, and other causes. There are a number of others waiting to be announced as well, which you will read here in coming weeks. * Hoosier Pro Wrestling will hold the annual Columbus Firemen’s Cheer Fund Toy Drive show at the HPW Arena/ 4-H Fairgrounds on November 7, featuring Wildfire Tommy Rich. Toys can be donated beginning at the October 3 HPW show. * Chaotic Wrestling will do one of its two annual Toys for Tots shows, first on November 13 in Woburn, MA at the Elks Lodge, 295 Washington Street, Woburn, MA. * Ring Wars Carolina presents “Homecoming 2015” on November 7 (7:30 pm belltime) at the Priscilla King Arena, 612 2nd street, Lumberton NC. Bring 2 canned goods and get $2 off the price of an adult ticket. * Atomic Championship Wrestling returns to Stevens Fire Hall (91 Stevens Road, Stevens, PA) on November 7 with a food and clothing drive, with donations going to Ephrata (PA) Area Social Services. * Wrestling for a Cause will run The Fight for Matthew on November 14 at the Owasso Sertoma Club, Owasso, OK (7:00 pm belltime) . 100% of the show’s proceeds go to the family of a child with cancer. * Primal Conflict Wrestling presents “A Night To Remember IX” on November 13 ((VIP Meet & Greet 6:00 pm/6:30 doors open/7:30 belltime at Harpers Ferry KOA, 343 Campground Road , Harpers Ferry, WV. A holiday food drive will take place at the show. * 2300 (ECW) Arena presents a Toys for Tots collection at the CHIKARA Pro Wrestling season finale at the 2300 (ECW) Arena on December 5 with a 7:30 pm belltime. * Atomic Championship Wrestling returns to Stevens Fire Hall (91 Stevens Road, Stevens, PA) on December 5 with a Toys for Tots collection. * Combat Zone Wrestling presents its annual Toys for Tots collection (in conjunction with the Marine Corps Reserve) to take place for the eleventh year in a row with Combat Zone Wrestling’s 17th annual Cage of Death on December 12 at the Flyers Skate Zone in Voorhees, NJ. * 2300 (ECW) Arena and Ring of Honor present a Toys for Tots collection at Ring of Honor’s Final Battle PPV on December 18 at the 2300 (ECW) Arena on December 18 with an 8:30 pm belltime. * 2300 (ECW) Arena and Ring of Honor present a Toys for Tots collection at Ring of Honor’s TV taping on December 19 at the 2300 (ECW) Arena on December 18 with an 6:00 pm belltime. * Wrestling for a Cause will run The Fight for Haylie on December 12 in Pryor, OK (7:00 pm belltime) . 100% of the show’s go to the family of a child with cancer. * Brew City Wrestling will run its annual Headlock for Hunger on December 11 at the Knight of Columbus Hall in West Allis, WI. The show features a food drive for the Hunger Task Force of Greater Milwaukee. Fans are asked to bring two non-perishable food items. * Chaotic Wrestling will do its second Toys for Tots show of the year on December 11th at the Woburn, MA at the Elks Lodge, 295 Washington St, Woburn, MA. * Keystone Championship Wrestling will hold its yearly Toys for Tots show, tentatively scheduled for December 19. * Great Canadian Wrestling presents Season’s Beatings ’15 on December 27 at Harmony Creek Community Hall, 15 Harmony Rd. N, Oshawa Ontario. This is the annual Christmas show for local food bank. Fans are asked to bring donations for Harmony Creek food bank. No matches yet announced. Next Story → Could The Rock Return To WWE?